Ever since my littluns introduced me to the world of Minecraft, I have spent lost days in front of the living room screen mining, building and surviving whatever hordes of enemies have come after me. Bearing in mind how computer game graphics have come along since the days of old, I find it amazing how such simple textures and sprites can still remain captivating. 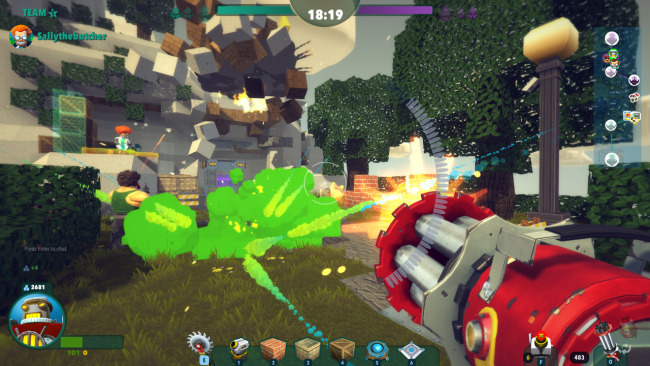 However, as I type this review I am craving to switch over to Steam and crank up Jagex’s Block n Load beta for another battle. Jagex has taken the thrill of mining and building blocks and combined it with a 5 on 5 objective driven first person shooter that results in a game with an element of both Minecraft and Quake. 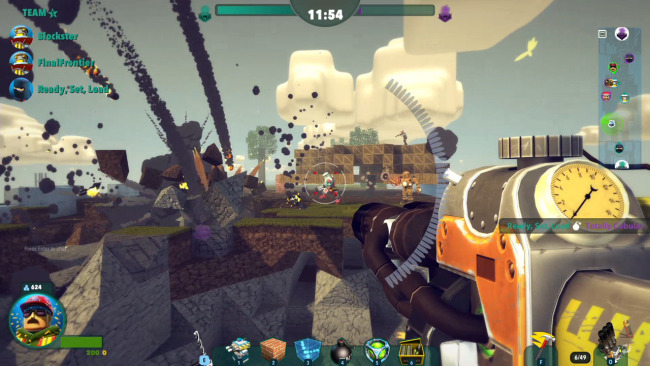 The aim of Block n Load is simple: defend your base and destroy your opponent’s. 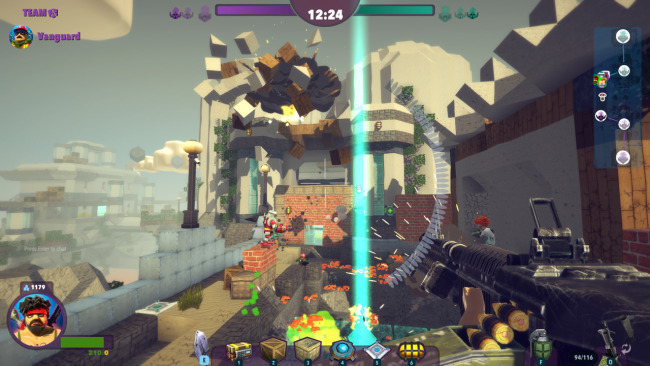 The game allows you to select from 6 characters each with their own unique blocks, abilities and weapons that you personally select once within a lobby. Additional unlockable bonuses are available such as new skins as you increase your XP while playing the game. A choice of 2 arenas can be voted upon within the lobby and range from currently 7 locations such as ‘Sky Bridge’, ‘Fun Factory’ and ‘Beach Base’, just to name a few. Each arena has its own tactical advantages and disadvantages keeping each match fresh and fun. Once the players are locked in and the arena loaded your team has 6 minutes construction phase to build the defences around your power cube before the force field barrier that segregates you from the enemy is removed. The key to success is through teamwork and it is at this point that you can identify whether this is happening. If you find yourself frustrated there is a delightful onscreen chat that allows you to constructively raise your concerns with the other players. I enjoyed the fact that you could observe the other team’s messages; helping you work out if the other team was having any issues. It seemed fairly common for one player to be constructing blocks while another followed and destroyed them! Each block or trap that your character lays costs you in bricks and once this has depleted you cannot construct any further, however this is not the end of the world as you can mine the ground to harvest more bricks and very soon carry on with your dastardly plans. I quite enjoyed playing as the ninja “O.P. Juan Shinobi” whose abilities allowed you to dig a hole, install a trap and place a holographic block on the surface that took on the appearance of the area around it. Muah ha ha ha. Encapsulating the power cube with sandbags seemed be a good defensive move, but be warned, the land is 100% mineable, barring the tiny bit of steel around your base, allowing your enemies to mine below you and appear behind as happened to me the first time I played. There is definitely a learning curve as you begin to get used to the character’s unique abilities and weapons all too soon! Once the timer reaches zero I found myself switching from my mining tool to my weapon of choice and charging towards the enemies power cube. It is at this point you realise how good, or how terribly hopeless, your defences are as you meet the enemy head on around the cleverly designed mid-point of the map that is unique to each arena. 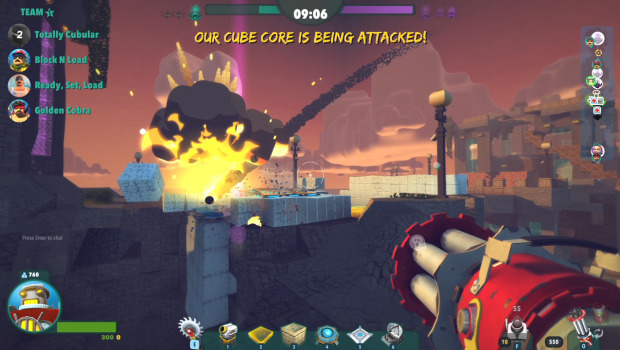 All-out mayhem ensues as your team pushes to be the first to overcome the enemy defences and destroy the power cube belonging to their base. Throughout the battle the ability to carry on constructing allows for further cunning plans to be put into action as the world around you constantly blows to pieces and alters. Upon death, which happens with a 100% certainty, you can select where to respawn on the map and after a short breather thanks to the respawn timer, you can resume the manic onslaught, full of new ideas and tactics. I found that the constant diversity in every game made it very appealing and enjoyable to play. I was never too sure what each player was going to build and how the landscape and tactics would change to accommodate this and this made sure to keep me on my toes. The construction of defences played as much a role as did the actual warfare and it was surprising how weaknesses could be discovered so early once the time for battle had arrived. Jagex have listened to feedback throughout the beta and reacted to the ideas of the players therefore moulding a game around their audience. Coming from a world seemingly dominated by games that require constant spending for the latest DLC to be able to carry on playing with other players I find it very satisfying that Block n Load is £14.99 with no future intention to charge for additional maps, blocks or features other than new characters and possible skins. Overall, the vibrant graphics, responsive game play and in-game randomness of the players make for a frustratingly addictive game that will have you riveted to the PC for “one last game” desperate to try out new learned tactics and construction methods whilst experimenting with each character’s abilities. No game ever plays the same as the last – and this keeps me coming back for more. Atari ST, PC, Xbox360 & PS4 gamer.Father and musician.Can normally be found lost somewhere in Bungie's Destiny during his spare time!